MGIMO’s Mikhail Troitskiy believes that Russia, India and China can rally other countries around their balancing project. Russia, India and China (RIC) have the greatest potential to counterbalance the West in the areas where the West presents the greatest strategic threats, in technology, conflict management, and international policy, said Mikhail Troitskiy of the Moscow State Institute of International Relations (MGIMO). “In any case, these three nations have the greatest potential [for] rallying other states around their balancing project,” said Troitskiy during a Eurasian policy conference at George Washington University this week. “The technological and doctrinal innovation by the West has long been a source of concern for Russia, China, and to some extent India, because the ability to innovate and drive the agenda gives the West a certain edge and limits the freedom to maneuver of those powers,” he added. According to Troitskiy, Russia, India, and China have historically “felt challenged by the West” in areas ranging from technical advantages, like space weaponry, to setting international doctrines, like the controversial responsibility to protect doctrine. In a memo published for the conference, Troitskiy outlined RIC reactions to challenges from the West in four basic ways: asymmetric means, imposing legal constraints, attempting to match or mirror western technologies or doctrines, and cooperation. These states have “countered Western doctrinal innovation by developing and promoting their own concepts,” wrote Troitskiy of the potential for these countries creating a rebalance. “They have argued that the principle of sovereignty is one of the few powerful stabilizers in world politics, together with a balance of forces that prevents the dangerous ‘hegemony’ of any single state,” he concluded. In recent years, Russia, India and China have teamed up with Brazil and South Africa to form BRICS. After the latest BRICS summit and creation of a BRICS bank, many experts are speculating that the nations could provide a counterweight to the West. Altogether, the BRICS alliance accounts for 40 percent of the world population and approximately 20 percent of world GDP. The trans-continental grouping primarily focuses on economic cooperation. 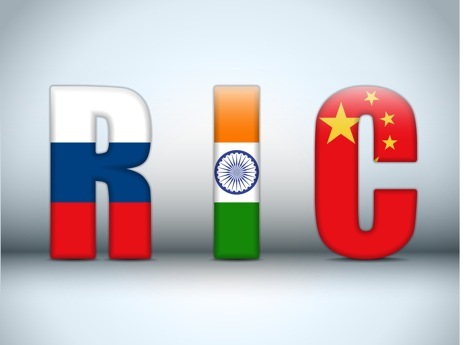 The RIC format has yet to take off on the level of BRICS. At present, the foreign ministers of Russia, India and China hold annual meetings. Russia seems the most eager to have a more engaged format, while mutual suspicions between India and China have slowed down the process.